Objective: The Seven Sevens is an 18 mile, 8100ft test of endurance and mountain skills . The objective is to climb all seven peaks in the Mourne Mountains that are over 700m* above sea level following your own route between fixed checkpoint. * The Six Sevens – Mountain Forming? For many years this event has been run under a false pretext thanks to a favourable anomaly on an earlier edition of the OSNI Mourne map. Slieve Meelmore is actually several metres short of the magical 700m height – exactly how many metres depends on which source you consult. In fact, 4 of the 7 summits have different spot heights on the current (2009) OSNI map and some of these are higher so the the total height is now 5203m which is only 2m down on the previous height. Organised for 25 years by The Spartan Redsox walking club, Lagan Valley Orienteers are now proud to take on stewardship of this iconic annual challenge walk. As one of Ireland’s premiere orienteering clubs LVO have over 40 years of experience in organising large events, including UK and Irish national events, in our parks and mountain areas. 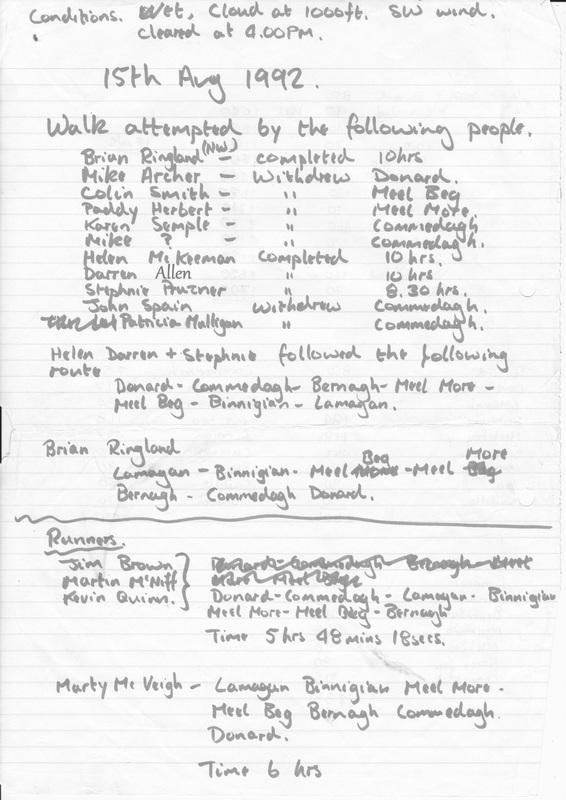 The first event in 1992 was organised in 1992 and had 11 walkers and 4 runners take part. Only 4 of the walkers completed the challenge and the fastest walker’s time was 8.30hrs. Click here to see the “official” results sheet. N.B. It was a free order challenge for many years until entry numbers grew so big that it became difficult to marshal all the checkpoints for such a long day. It is important to note that this site is for the Challenge Walk only. It’s not a race; there are no prizes. If you plan to do the mountain race which is run as a separate event then you should consult the Northern Ireland Mountain Running Association (NIMRA) website http://www.nimra.org.uk/. Participants need to be have the skills, fitness and experience to complete a walk of this length in the high mountains. Navigation skills are essential in poor weather.